Next time you’re working in your hog barn, take a quick glance at every fourth pig. Why? More than one fourth (27.2 percent, to be exact) of U.S. pork and pork variety meat production was exported from January to March 2017, which put more money in your pocket. “U.S. pork exports provided $52.42 of added value per head, based on January to March 2017 export figures,” said Bill Even, CEO of the National Pork Board. The Pork Board is working hard to ensure this momentum accelerates, especially as domestic pork production continues to grow. In fact, the Pork Board increased Checkoff funds for 2017 international activities more than 12 percent compared with 2016. “Rapid growth in the U.S. pork industry makes exports more essential than ever,” Even said. Dermot Hayes, an economist and distinguished professor in agriculture and life sciences at Iowa State University, agrees. With a planned increase in U.S. packer capacity, packers will be able to handle 6.1 percent more pigs this fall than in the fall of 2016, said Steve Meyer, vice president of pork analysis for Express Markets, Inc. Analytics. Increases of another 1.6 percent and 2 percent by the autumns of 2018 and 2019, respectively, also are expected. Meyer estimates that there will be about 4.1 percent more pork this fall than in 2016. 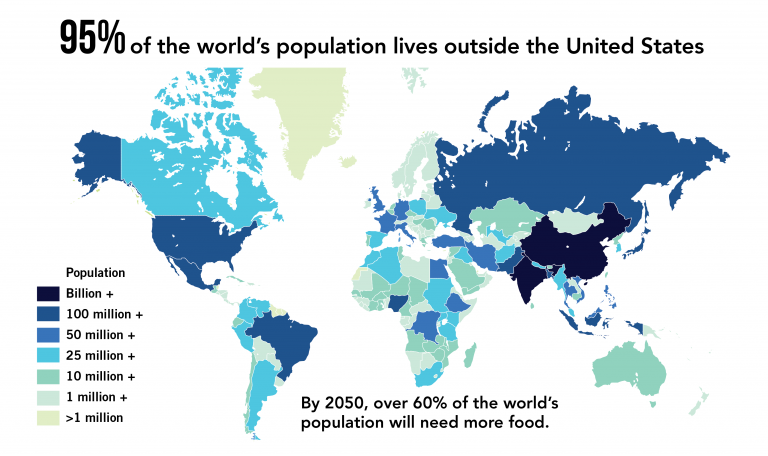 More than 95 percent of the world’s population lives outside the United States, and demand for high-quality protein continues to grow worldwide, said Bill Luckey, who chairs the Pork Checkoff’s International Trade Committee. Pork also remains the No. 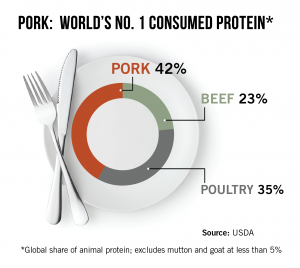 1 meat protein consumed worldwide. These combined factors are why the Pork Board committed additional resources for export market development in 2017. 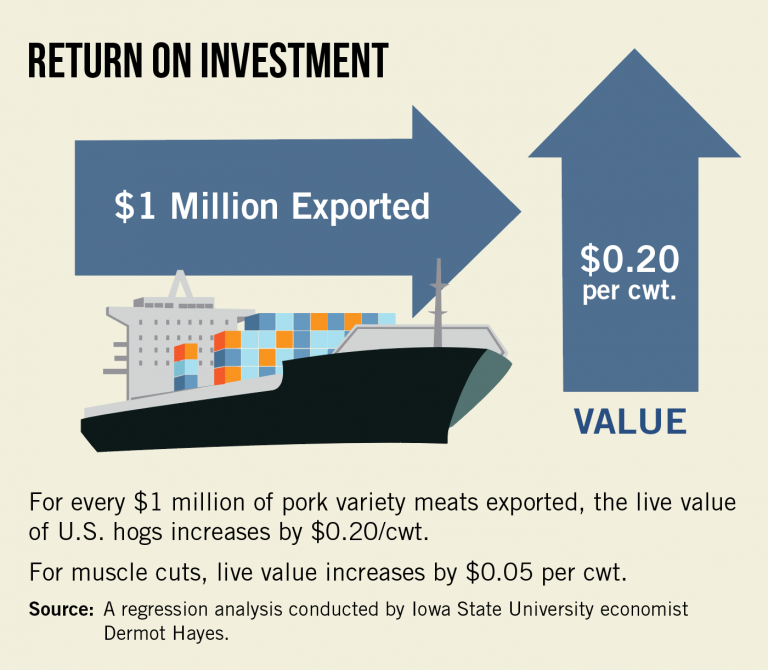 Your Pork Checkoff investment impacts the dynamic world of international trade to expand pork exports and boost pork producers’ bottom line. Following are 10 key points. More international consumers crave U.S. pork, according to the U.S. Meat Export Federation (USMEF). This is reflected in the way exports grew from just 7 percent of production in 2000 to more than 27 percent by the first quarter of 2017. The United States has become the world’s largest pork exporter and is expected to dominate the global pork market over the next 10 years, according to the USMEF, which partners with the Pork Checkoff to develop overseas markets for U.S. pork exports. Value-added products, variety meats, and pork muscle cuts are helping the National Pork Board increase U.S. pork exports through access to new markets and expansion of existing markets. The five-year Checkoff Strategic Plan goal? Achieve a 9 percent average annual increase in value and volume. While an aggressive goal, it’s doable, Even said. That is great news for producers, according to Luckey. The Nebraska pork producer is pleased to see U.S. pork export demand rising, especially with expanding U.S. pork supplies and political uncertainty. The safety, consistency, high quality and affordability of U.S. pork set it apart from the competition. The Pork Checkoff ‘s marketing efforts with the USMEF promote the positive attributes worldwide. “The focus in each market is different based on opportunities, consumption patterns, price and other key factors,” Luckey said. The Pork Checkoff Trade Committee prioritizes international markets each year and allocates funds accordingly for the USMEF to carry out market development activities. Each export destination offers different challenges and requires tailored marketing approaches. Initiatives to promote U.S. pork include everything from direct consumer messages to educational seminars for importers and processors. The Checkoff also hosts international trade teams and supports reverse trade teams that allow U.S. packers and exporters to align with importers and potential global customers. The U.S. pork industry also invests Checkoff funds in research and economic analysis each year to gauge export growth opportunities and to identify and apply scientific approaches to reduce trade barriers. Although trade deals such as the Trans-Pacific Partnership and the North American Free Trade Agreement (NAFTA) have been a major focus in politics, a protectionist approach isn’t good for agriculture, said Iowa State’s Hayes. He noted that Mexico and other key buyers of U.S. pork already are negotiating lower import duties and more free trade agreements with other nations. Mexico, Japan, and China remained top markets for U.S. pork in the first quarter of 2017. The volume of U.S. pork exports to Mexico rose 29 percent from January to March 2017 compared with the same period a year ago. Mexico consumes over 7 percent of U.S. pork and pork variety meat production and about 40 percent of U.S. ham production, much of which is further processed there. U.S. chilled-pork exports to Japan were up 3 percent in volume and 10 percent in value in the first quarter compared with 2016. China remains a huge market for U.S. pork, in part because of the nation’s massive population. U.S. pork variety meat exports to China and Hong Kong remain strong and have grown 24 percent in volume compared with last year, he added. The United States exported pork to more than 110 countries in 2016, and while all of those markets differ in size and potential, all are crucial, Luckey said. U.S. pork exports to South Korea, the No. 6 U.S. market, were up 31 percent January through March compared with the same period a year ago, thanks to duty-free access from a free trade agreement. Canada, the No. 4 U.S. market, showed small increases in the first quarter. The day may not be that far away when 1 in every 3.4 pounds of pork traded in the world will originate from the United States, according to the USMEF. Building new export opportunities for U.S. pork doesn’t happen overnight, as Luckey points out. As a participant on trade missions to Colombia, Argentina, and Peru, he’s seen firsthand the initiatives needed to grow sales in emerging markets. Once these relationships take root, however, they benefit U.S. producers. In the first quarter, the volume of U.S. pork exports to South America (Colombia, Peru, and Chile) soared nearly 95 percent. Also, Honduras in Central America showed an increase of 14 percent for the first quarter compared to 2016. Other markets, such as the countries in the Association of Southeast Asian Nations, restrict trade access, but the growth potential is clear. A variety of ever-changing market factors influences which nations can supply pork at the most competitive prices. For example, 2014 and 2015 were tougher for U.S. exports due to a strong dollar, a lack of access to major markets and the West Coast port labor disputes. With vigorous global competition, the United States must provide the types of pork products that buyers want, in the form they want it. “We have to understand each country’s unique needs and be as accommodating as we can,” Luckey said. Variety meat exports were up 22 percent in volume and 33 percent in value during the first quarter, compared with the same period in 2016. Sales were dominated by China/Hong Kong and Mexico, which account for about 85 percent of the variety meat export volume. Many variety meat products traditionally are not consumed by U.S. domestic consumers, but they fit well into diets and cultures of other markets, said Luckey, who has traveled to China and Mexico on trade missions. A large portion of variety meats produced in the United States is rendered, which can mean only pennies on the dollar for producers. For the past three years, the Pork Checkoff has led a project to determine ways to add value to variety meats and by-products. “The research showed that a by-product of pig blood can be used as a ‘binder’ for meat and variety meats to produce low-cost, high-nutritional products to consumers in other nations while returning value to U.S. producers,” Luckey said. With more than 130 million people and an annual per capita pork consumption that tops 35 pounds, Mexico shows no sign of losing its appetite for U.S. pork, especially with a growing middle class. Domestic pork production cannot keep up with demand, according to the USMEF, helping to make Mexico the No. 1 destination for U.S. pork by volume.Mexico imports U.S. hams, picnics, Boston butts, skins, trimmings and variety meat. The marketing strategy for our southern neighbor is focused on building and reinforcing long-time purchasing loyalty among targeted buyers and on educating potential buyers on how to effectively handle and merchandise a variety of pork products, according to the USMEF. In the first quarter of 2017, demand from China and Hong Kong for U.S. pork exports was strong, fueled by strong pork variety meat sales, according to the USMEF. While trade access and geopolitical issues came into play, China and Hong Kong were the second leading U.S. pork market in terms of volume.The pork industry is building long-term purchasing loyalty with China and Hong Kong by positioning the United States as a reliable supplier of safe, high-quality pork that consistently meets expectations. The USMEF also is highlighting U.S. pork’s versatility, high quality, and profit potential. 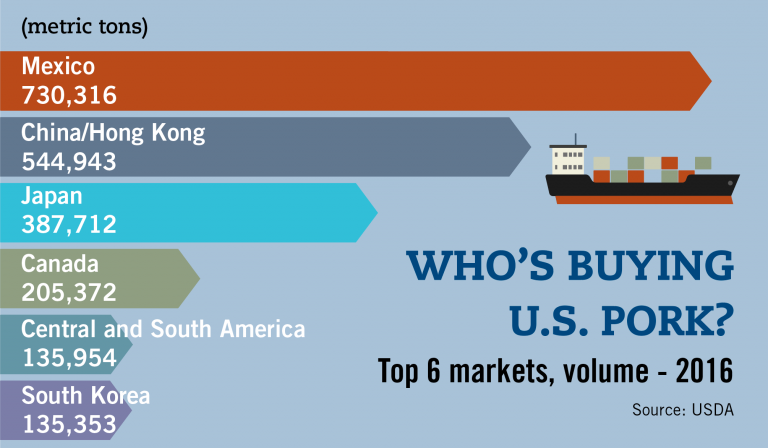 Japan continues to be the top value importer of U.S. pork and third in terms of volume. The country boasts an annual per capita pork consumption of almost 45 pounds and a population of 126 million people.While there is potential to increase sales of U.S. pork to Japan, more than 20 countries export pork to Japan. The fierce competition and an aging population create challenges for U.S. pork sales to Japan. The main goal is to defend market share and increase the volume of cuts sold. This will be accomplished by highlighting different ways to prepare pork and by further developing the market through expanded sales of chilled (never frozen) U.S. pork to new and existing users. Canada’s 37 million people consume less pork than their U.S. neighbors, with an average annual per capita pork consumption of 55 pounds. And, they export nearly two-thirds of their own production.Canada, our fourth biggest customer by volume, is a very good trade partner for further processed pork items, such as bone-in hams, boneless picnics, and trimmings. At the retail level, boneless loins, tenderloins, sirloins, and spareribs offer additional opportunities for U.S. pork exports. Marketing efforts north of the border include assisting customers with import processing opportunities, as well as building strong relationships with key importers, processors, and retailers. A growing middle-class population with an appetite for pork makes Central and South America welcome destinations for U.S. pork. The region ranked fifth in the volume of U.S. pork sales during the first quarter. Marketing efforts are focused in the countries of Chile, Peru, Colombia, Honduras and the Dominican Republic.The overall strategy in Central and South America is to defend market share by positioning U.S. pork as a safe, healthy protein choice while also focusing on consistency and high quality. The USMEF is targeting new customers for U.S. pork by introducing a full line of pork products in the marketplace. South Korea boasts a population of over 50 million people with a per capita pork consumption of over 80 pounds.South Korea regained momentum after a slow year in 2016, making it No. 6 by volume for U.S. pork sales. Most U.S. pork now enters Korea duty- free under the Korea-U.S. Free Trade Agreement, which has helped boost sales of raw material for further processing, as well as for processed pork products. The USMEF is working to defend U.S. pork’s export market share and to further develop the market for U.S. products for further processing and U.S.-branded pork.